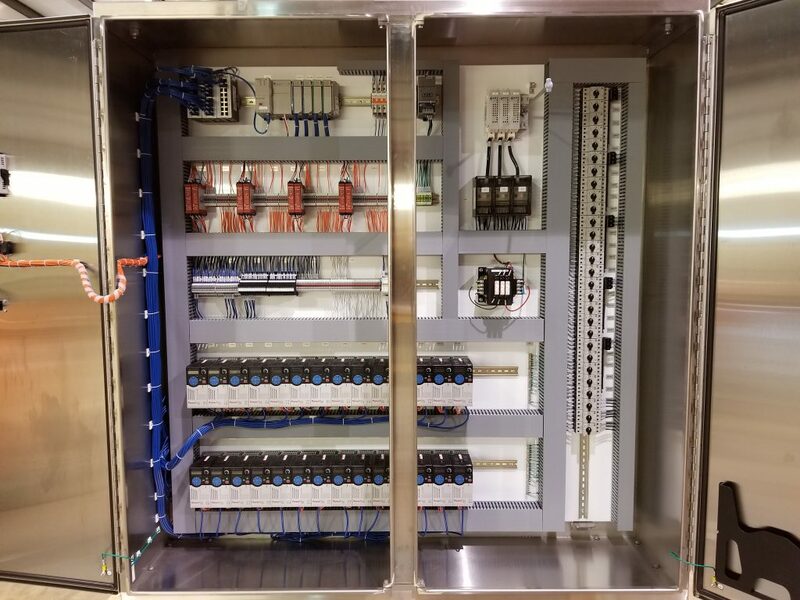 There are many types of controls panels that are built to custom specifications, all of which come with their own unique design challenges. Drive panels can range in size from a single drive to dozens of drives in an enclosure. Material handling systems often require dozens and can be very difficult to engineer correctly. Manufacturer’s recommendations often offer you the best practice for mounting and spacing requirements. Even if you follow the manufacturer’s specifications, heat calculations are still required to ensure sure your system is designed correctly. IPS just completed a large two door free standing control panel packed with VFDs designed to drive a material handling system. Let’s take a closer look at how IPS helped solve this problem for an integration partner in Iowa. When designing a drive panel for conveying, we often must put multiple drives and feeder protection into a large enclosure. Heat loss, air flow, ambient temperature, and enclosure size all play a critical role in designing these types of panels. IPS uses a variety of tools to help calculate the necessary cooling requirement for panels packed with VFDs. In some cases, constant air flow is enough to effectively manage the temperature in the panel. These critical calculations can lead to immediate cost savings for the control panel. Longevity is often over looked when purchasing material handling equipment. If your system is designed properly, downtime and lifespans should not be of concern. Many times, facilities allow drives to run until failure to get the most useful life out of them. With this perspective, it is important to give your drives a cool, clean and safe environment. Providing the proper environment for your drives will help reduce your downtime and keep your process running longer. Our integration partner understands the importance of design and allows IPS to design each system of theirs. Our partnership allows them to focus on their expertise and allows IPS to provide their customers with high quality panels. Knowing that our panel gives our client, and their customers, the best opportunity to be successful makes us proud. Driving the world forward one panel at a time… That’s why we come to work at Industrial Panel Solutions!